UNITED NATIONS, December 19 -- Three human rights votes were taken Monday morning at the UN, to condemn the practices of Syria, North Korea and Iran. All three have been in the news: Bashar Assad for Homs, North Korea -- the Democratic People's Republic of Korea to some -- for Sunday's death of Kim Jong-Il, and Iran of late for finding a US drone and then, they said, a spy. These events and trends may have impacted the vote outcomes. Syria drew the most condemnations, 133, with DPRK second at 123 and the Iran vote decidedly more mixed: 89 condemning, 30 supporting and 64 abstaining. Iran might say there were more not condemning, including abstentions, than condemning. Sudan, interestingly, voted to condemn Syria, but not Iran or North Korea. Skeptics attribute Khartoum's anti-Assad vote to an attempt to "go mainstream," or at least be taken off the US state sponsor of terrorism list. Qatar, meanwhile, seemed to some to lack coherence, voting to condemn Syria, abstaining on North Korea and voting to not condemn Iran. Saudi Arabia, which accused Iran of trying to kill its ambassador to Washington, surprisingly abstained on Iran, while voting to condemn both North Korea and Syria. Afterward Iran's Permanent Representative came to the stakeout and Inner City Press asked him about Camp Ashraf, which Iraq says it will close by December 31. He said that most can return easily to Iran, but a few "need" to be put on trial. UN envoy Martin Kobler is publicly asking for an extension of time, while privately looking to move the Campers to an ex-US base in Iraq. Watch this site. Footnote: following Kim Jong-Il's death, statements issued from the US, China, the UK, Russia and Germany, among others. But after a long silence from Ban Ki-moon, whose office told some journalists they would revert early Monday morning, a bland statement was read out at the noon briefing. 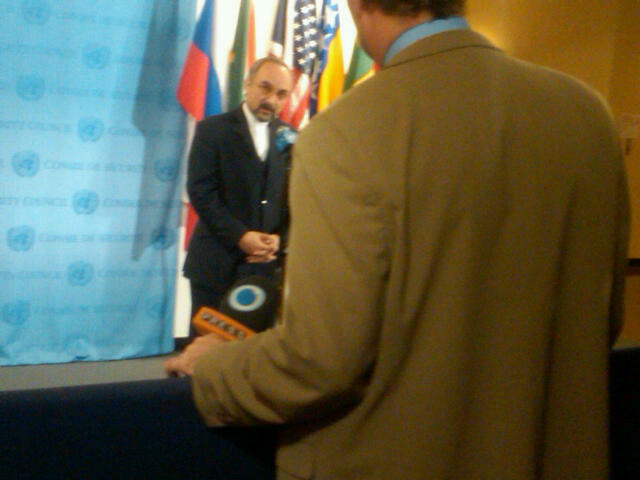 Inner City Press asked Ban's associate spokesman Farhan Haq if Ban had, like Obama, called South Korean President Lee. Not yet, Haq said. And by four pm, still nothing.